Don’t let those beautiful pumpkins go to waste once fall is over! Learn how to store pumpkin over the cold season so you can enjoy their delicious benefits all winter long! So you love fresh pumpkin! Then you obviously find it hard to part ways with all those pumpkin soups, pumpkin pies and other lip-smacking pumpkin desserts you’ll keep making in fall! I hear you, we’re in the same boat. But no worries, I have a couple of easy peasy tips on how to store pumpkin over winter so you can continue enjoying all this deliciousness all winter long (or more). Need more ways to preserve fruit & veg? There are a few methods for how to store pumpkin and you may want to choose the one or the ones that best fit you and your cooking preferences. Storing pumpkin as a whole. Preserving pumpkin as a whole can be a bit tricky and the results are not always the best. Storing pumpkins requires an area where they’re protected from frost. But if that storage space gets just a little too warm at some point, it will also cause harm to your pumpkins so storing them in your home is not an option. A certain level of humidity is also required and they also need to sit on a cloth or cardboard and should definitely not touch each other. 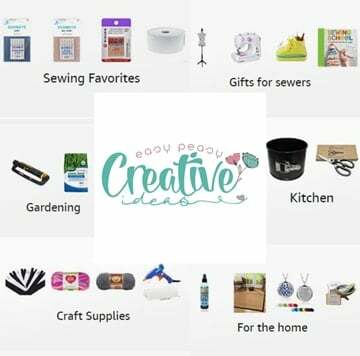 So you’ll need a larger storage area. If your pumpkins are carved, you may want to opt for saving the flesh and use in future recipes. Carved pumpkin is a lot more hard to preserve as a whole than uncarved pumpkin. 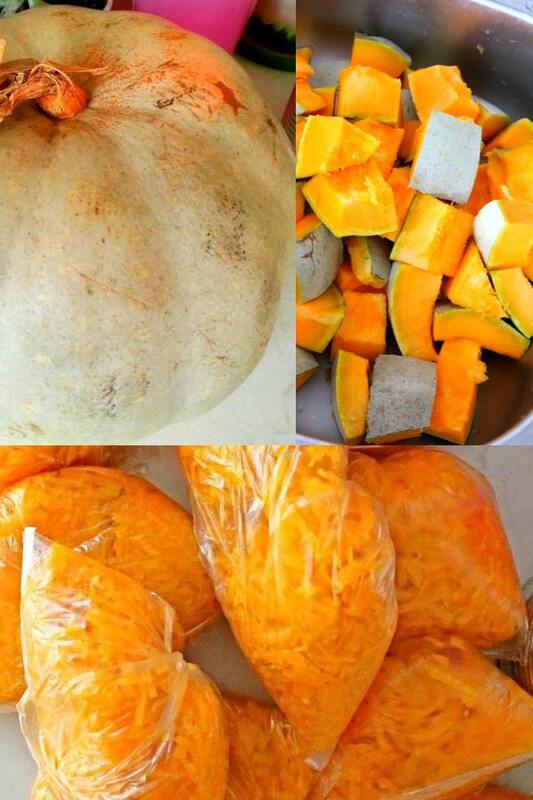 Simply cut pumpkin in slices place them in containers or plastic bags and store in the freezer. When ready to use, thaw first, remove the peel, cut or mash the flesh and use in recipes. I personally find this method the worst way to preserve pumpkin as it takes away a lot of the quality of the product. 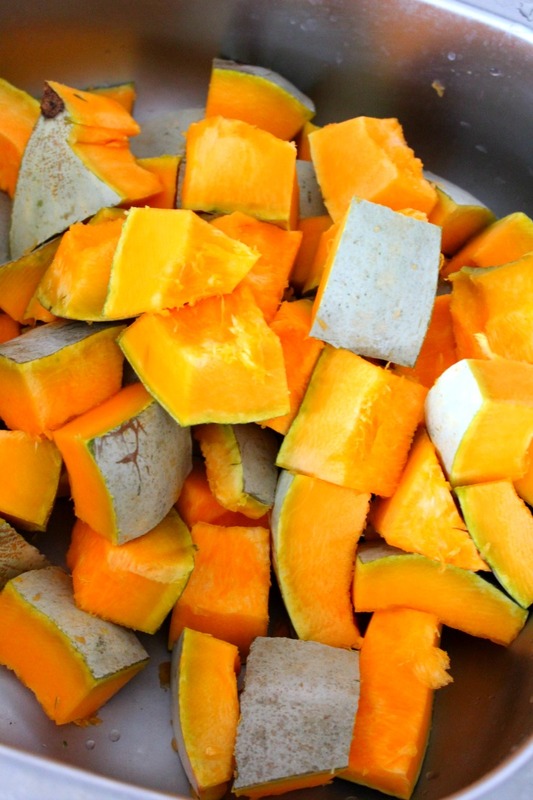 Cut pumpkin in slices, remove seeds, remove peel and dice flesh into cooking-size sections. Cook flesh in boiling water, until soft. 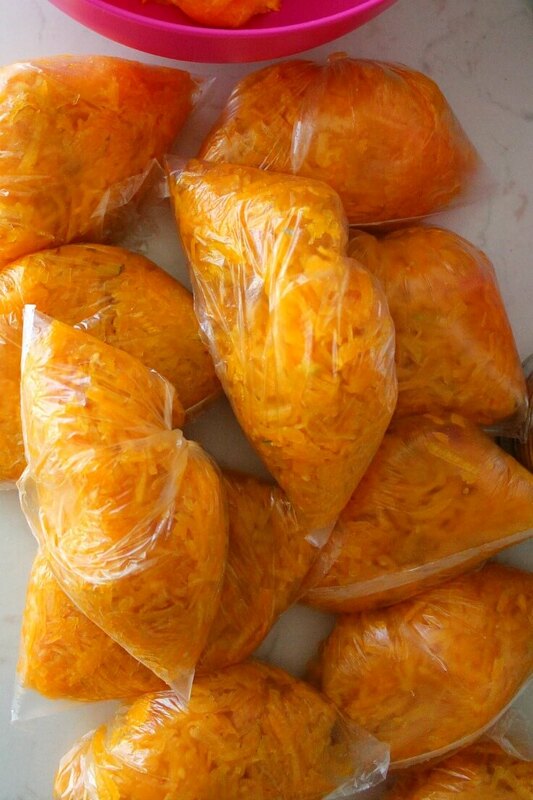 Remove from pot and mash then cool and pack into containers or freezer bags and store in the freezer. I find storing whole pumpkins a little too high maintenance for me. Simply storing the slices won’y fit my needs and storing puree is not an option as pumpkin loses a lot of its qualities through boiling. So I always rely on this very simple method of storing and preserving the flesh for winter. If you want to learn how to store pumpkin the way I do, read along and I’ll show you the easy steps in a couple of minutes. Can you freeze pumpkin? This is a question I heard a few times in the last years and the answer is yes, but probably not the way most people think it is done. 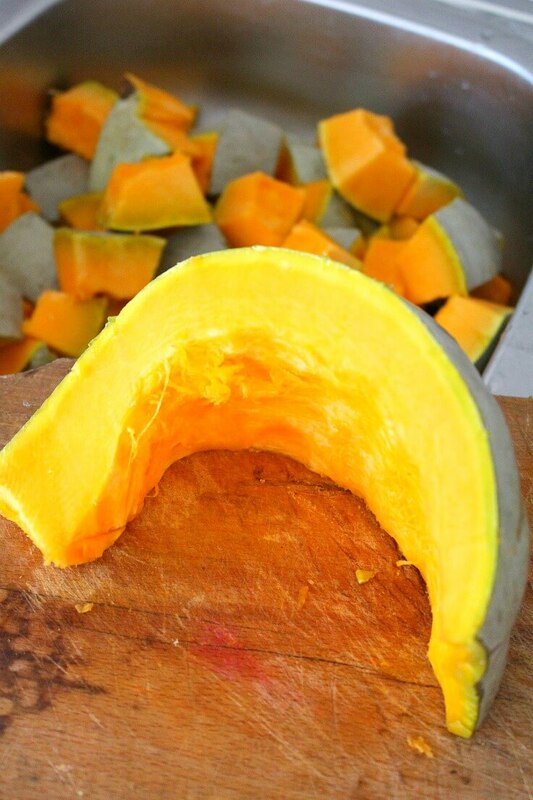 Below I’ll show you how to freeze pumpkin and have it ready to use in all sorts of recipes. Freezing is the best way to preserve pumpkin flesh, without altering the quality of the pumpkin significantly. At this point you can either peel the skin off or keep it on and discard once the flesh is grated. You could also peel the skin just after cutting pumpkin into slices but I found that methods is a little trickier than working in smaller sections like diced pumpkin. Grate the flesh over a sink to prevent spilling. 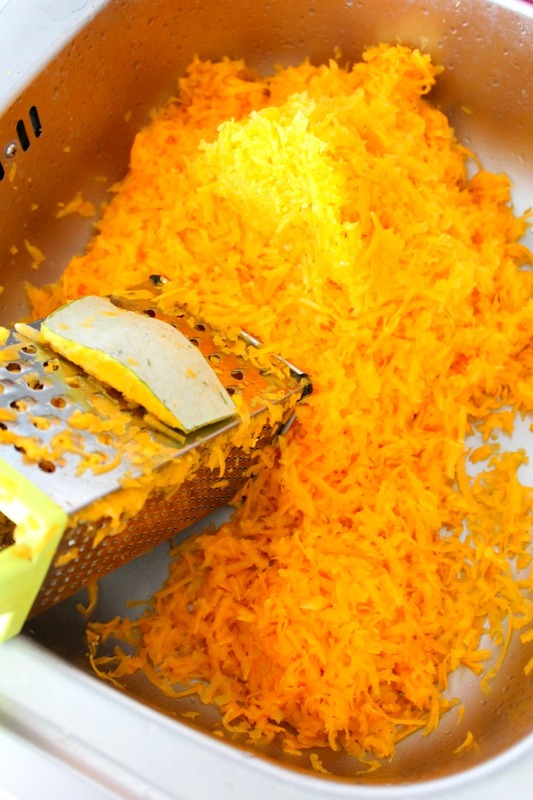 The flesh normally tends to spill all over the place when grated (floors, countertops etc) and will end up in the trash. Grating in a disinfected sink will save you lots of flesh. If your pumpkin is extra juicy, place a tray or a flat dish at the bottom of the sink to save that juice once all the grating is done. You could use the juice fresh or preserve it by freezing in ice cube trays. 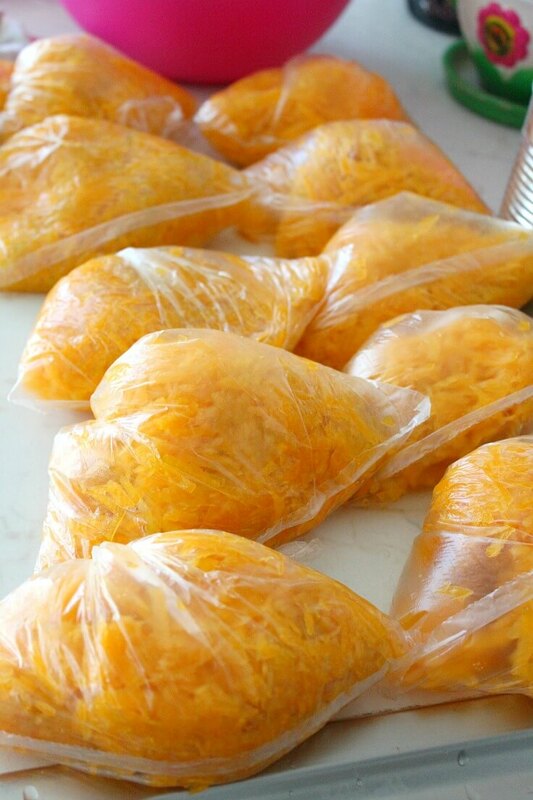 Fill freezer or plastic bags with the grated flesh. I like to store about 2 cups per bag. Store in a deep freezer for up to 6 months. I know some people are reluctant to use pumpkin after 3 months but I found my grated pumpkin bags are very well preserved even after 6 months. It’s all up to you, of course. When ready to use in recipes, thaw the bags thoroughly (preferably over night, on a shelf at the bottom of your fridge). This is great – I would love to be able to keep my fresh pumpkin instead of buying canned all the time!